Last week I started a new feature on my blog where I share some of the neat stuff I find on Pinterest. Welcome to the second week of "Pin It Wednesday"! Today's theme is "quilt block tutorials". My interest in different quilt block patterns has been growing ever since I made my log cabin mug rug and my summer pinwheel pillow last month. I foresee several new quilt block pillows in my future, and the tutorials I'm linking to today are definitely on my list to make. Aren't these gorgeous? The herringbone block is so beautiful, and you really must go check out the full herringbone quilt that Holly just posted. It's really amazing. I love the color combination that Jennifer used for her starflower block. She has the whole ROY G BIV color order going on, which I of course love :) I'm really excited to make a pillow using this tutorial. I think it will look nice with my summer pinwheel pillow. The hexing around block is stunning. Lee includes a template for the center hex in her tutorial. Give this a try... the tutorial doesn't sound as complicated as the block looks. And how cool is the paper piecing circular geese block?!? I love the colors in this block, as well. In her tutorial, Christina says that paper piecing gives you beautiful, perfect points every time. I can't wait to learn more about this technique. 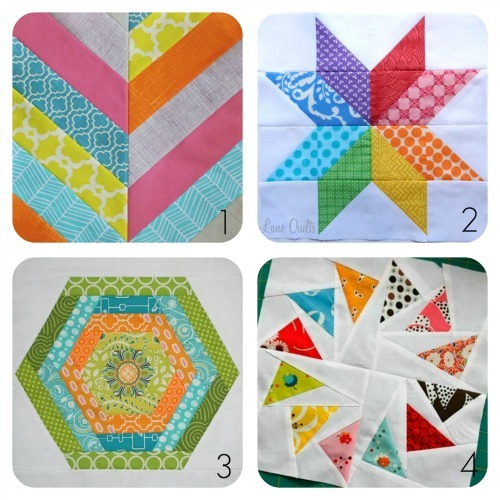 Do you know of a great quilt block tutorial? If so, leave a link in the comments so I can check it out. Thanks! If you're interested in seeing the other tutorial pins on my Pinterest board, click HERE. Interested in seeing ALL of my Pinterest boards? Click HERE. No clue what Pinterest is? Click HERE. 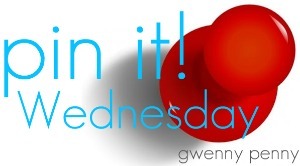 Great little round up Gwen! As a newbie to the quilting world, I love learning the names and techniques associated with the various blocks. I don't have a link, but I am reading a wonderful book right now "130 Mini Quilt Blocks" (2011) by Susan Briscoe and breaks down the technique for 130 blocks using precuts! really fun. Thanks! Love them, especially the hexagon one! Great picks again, Gwen! The colors are gorgeous. I may have to try paper piecing with that flying geese block- it's lovely! Those blocks are fantastic! I especially love the rainbow star block...so pretty! Ohhhh this is lovely Gwen!! Nice roundup! I am going to enjoy your pin it Wednesdays! I love pinterest too!! that herringbone one is my favourite of these but I also really like the hex block. The colours are so cheery in all of them too. It makes a great photo! Thank you for the links, I am discovering the crafty side of me. I adore that circular geese block and have been wanting to get my hands on the pattern! Thank you so much for posting this! You know how jealous I am of your quilting skills - and now you have to show me other people's awesome skills too? It's just not fair!! !